How the Nets took over BK in six easy steps. F or the first time since 1957, there is a professional sports team in Brooklyn. While the intrigue and speculation surrounding this team (and the arena, and the borough) had reached a fever pitch since the offseason began almost four months ago, the 2012-13 inaugural regular-season game marks the end of an eight-year buildup to move the Nets from East Rutherford to Newark to Brooklyn. As is the case with any large-scale development that inspires gentrification whispers (which eventually turn into gentrification megaphone wails), anything associated with the new Nets had as many detractors as supporters. But as time passed and the Atlantic Yards project went from a developer’s dream/resident’s nightmare to a giant hole in the ground to a half-completed structure that would never be finished to a copper-colored Independence Day alien craft to the nicest arena I’ve ever stepped foot in, the response to a new franchise in Brooklyn and the Barclays Center (It’s just so shiny and clean and they have sushi) has been giddy with excitement and pride. For decades, putting a team on the floor in the name of Brooklyn was a fairy tale. It seemed so far away. But then marquee players were traded for and signed (and re-signed), and they seemed genuine in their excitement to have “Brooklyn” streaking across their chests. And then the logo came. And then the Barclays Center was completed. 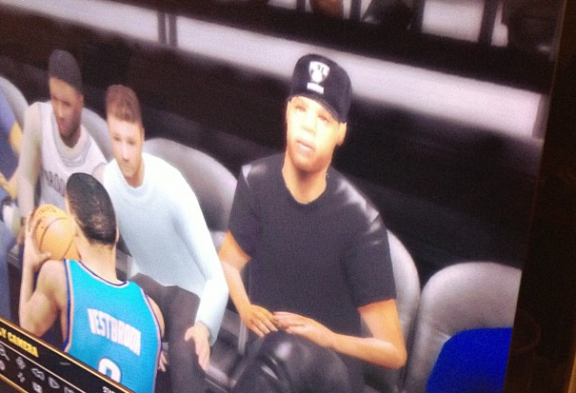 And then Jay-Z showed up and seemed content not to leave. This offseason was crucial to solidifying a roster, but it was also the make-or-break time for the franchise to get the borough on its back. At times, this seemed like an insurmountable task, but somewhere along the line it became clear that the way to achieve this goal was to stare the people square in the face. It had to stop being about the Nets. The sole focus had to be on Brooklyn. BROOKLYN. And once it became about Brooklyn, that’s when it got fun. When you emerge from the depths of the Atlantic Avenue train station, chances are that within 15 steps your eyes will find the monstrosity that is the Barclays Center. It’s huge — like a meteor landed on Flatbush Avenue, someone hooked LED lights to it, installed a Starbucks, and designated it an arena. While the behemoth edifice is the most massive entity in the neighborhood, an equally startling venue exists just across the street. 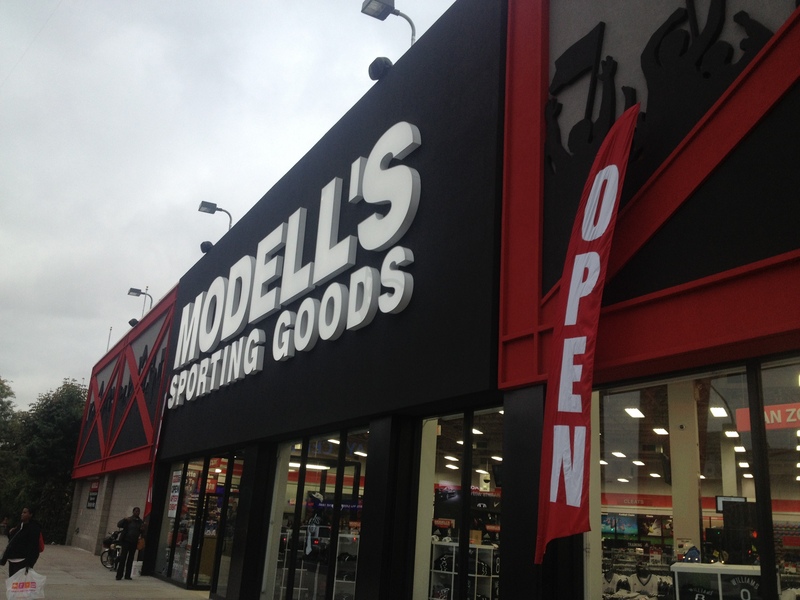 That place: Modell’s. Mugs, water bottles, wool banners, slippers, flags, baby bibs, wall clocks, pennants, license plates, decals, magnets, key chains, lanyards, badge holders, bottle openers, stickers, earrings, and yes, temporary tattoos. 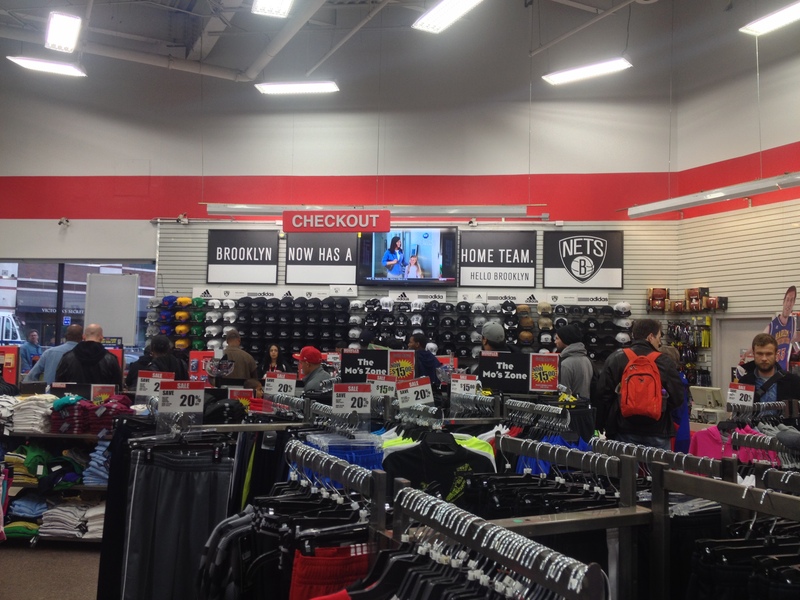 They really want people to get into the Brooklyn Nets, to the point that this Modell’s has practically de-recognized the rest of the professional sports teams in the city. The black-and-white color scheme has overtaken every corner of the establishment. And while the word “Nets” does play a part in much of the apparel, the focal point is so clearly Brooklyn. “Nets” taps into the uncomfortable part of the local psyche — signifying that this team is just a bunch of “out-of-towners” — but “Brooklyn” balances it all out by suggesting familiarity, a sense of home, pride. That Brooklyn is proud is no secret, which makes the marketing campaign of the team’s apparel a stroke of genius. 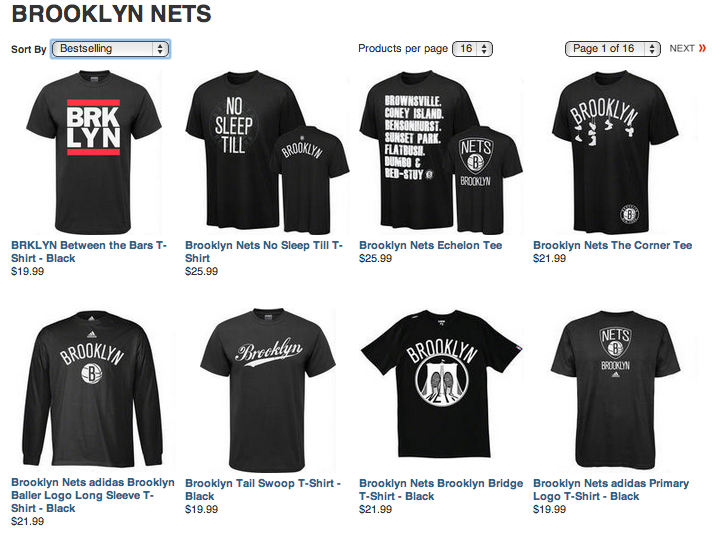 Look at the Nets gear on Modell’s website: Virtually every item prominently features “Brooklyn” text. This isn’t just marketing; people are coming around to this team. The ability to literally wear Brooklyn on your sleeve has been integral, but what has been truly transformative is the language and imagery surrounding the team as a reflection of Brooklyn’s history and its residents. The last we saw of professional sports in Brooklyn, the Dodgers were being shipped off to Los Angeles. It was a move the borough took personally, and while it happened 55 years ago, it’s still one of the biggest “chip on your shoulder” selling points the Brooklyn Nets used to draw people to their side. The message is simultaneously bitter and hopeful. On the surface, that doesn’t sound like an effective combination, but there couldn’t be a more appropriate way to market a new Brooklyn sports team than by harping on disrespect and greener pastures. That’s the balance that seems to be the focal point: Remind residents that they were done wrong. Now it’s time to show the world what we’re made of. The language is Underdog-ese, suggesting that the team, like the borough, has something to prove. It’s an old sports trope: Nobody believes in us. It fuels Brooklyn’s outmoded “second-class” reputation compared to Manhattan — this is why everyone who lives in Brooklyn will tell anyone within earshot that they live in Brooklyn. As for the team, there’s no better way to get a collection of individuals on your side than with sympathy; rope ’em in with sadness, then prove naysayers wrong and come out on top. In a continued attempt to connect with their constituency, the Nets have done things that suggest they’re looking for the borough’s blessing before the season starts. Almost as a way to combat the very “I’m here, what of it?” nature of the arena, the players and the way they’ve been marketed is working in opposition, simply by wanting everyone to like them. Just look at the subway advertisements and billboards featuring the team’s four best players: Deron Williams, Joe Johnson, Gerald Wallace, and Brook Lopez. A guy who loves his college, a comic book nerd, and a fisherman. Those three, plus a loving father of four, and you’ve got yourself some normal-sounding dudes who happen to play in the National Basketball Association. That’s the message, and from the introduction to the glitz-free descriptions, it’s clear that this is an attempt to penetrate yet another level of the Brooklyn resident’s psyche. It’s all one big wear-down, a battle of attrition, and Brooklyn’s new team is showing no sign of letting up in their all-out pursuit. When LeBron James pulled a fast one on Cleveland and hopped on the first plane to South Beach in 2010, a celebration like none other took place in Miami’s AmericanAirlines Arena. Yes, that is a massive stage, “YES WE DID” Obama-esque chants, smoke, pyrotechnics, “Simon Says” by Pharoahe Monch to open, and “I’ve Got a Feeling” by The Black Eyed Peas to close. It was a fitting event for the abyss of self-regard that is Miami, Florida. While nowhere near as big a story, the addition of Joe Johnson, as well as Deron Williams’s re-signing, gave Brooklyn one of the elite backcourts in the league and some legitimacy in the Eastern Conference. Also, it meant the Nets now had two marquee players to market. When the deal was done and it was time for Brooklyn to formally meet its new backcourt, it was cause for a celebration not very different from what transpired in Miami two years ago. But instead of a glitzy venue, the Nets party took place on the steps of Brooklyn’s Borough Hall. Instead of jerseys, Joe and Deron wore suits. And instead of promising “at least” seven championships, followed by explosions, Joe thanked the borough for welcoming him and his family. Borough president Marty Markowitz then declared it “Deron Williams and Joe Johnson Day” in Brooklyn. Then came the streamers. While there was something slightly budget about that high school pep rally, it fit right in with the atmosphere the team is trying to cultivate. Brooklyn is “home” and Brooklyn is “family.” Brooklyn is BROOKLYN. It might not have been the most buzzed-about story, nor the best-executed production, but it felt right. and stress the players as extended family, and highlight the team as representatives of the borough’s history, there was still one missing piece that no player, coach, owner, or developer could pull off. Because they’re all still outsiders. They needed a homegrown cosign. Someone willing to make it his or her personal mission to bring the borough along. Let it be known that regardless of how big or how little the size of his ownership stake in the team, Shawn “Jay-Z” Carter is the most critical factor in establishing Brooklyn basketball. Jay wore jerseys, then traded them for button-ups — “I don’t wear jerseys, I’m 30-plus” — then nine years later, on the Barclays Center stage, he rapped that same lyric from “What More Can I Say” while wearing a Brooklyn Nets “Carter no. 4” jersey. Now they’re the most in-demand jerseys in the official Nets store. Even if it means totally contradicting himself, Jay-Z is determined to make the Brooklyn Nets the coolest team in sports, by any means necessary. He opened the arena, playing eight shows in nine nights. He wore his Nets gear at every show, and when wife Beyoncé joined him on the last night, she came out rocking a Brooklyn Nets leather hat covering three pounds of brownish-golden locks. During the first episode of NBATV’s The Association, which focuses this season on the Nets, the first commercial was for NBA 2K13. Whether you like it or not, the Brooklyn Boy is not letting himself out of your sight. During his show, Jay said that it was his dream to “give Brooklyn its own franchise.” He’s not quite the “Black Branch Rickey,” as he once described himself, but he’s done his part. It’s no shocker that the men whose power more closely resembles Rickey — owner Mikhail Prokhorov, developer Bruce Ratner — have been relatively quiet in the past few months, handing off the reins to Jay-Z or Markowitz. The latter are men who are inextricable from Brooklyn. Logically or illogically, people trust them. Yes, they care about the Nets franchise, but their care for Brooklyn supersedes all. The Barclays Center isn’t the Field of Dreams. Simply building it wouldn’t have ensured anything. But that’s not all they did. And so here we are, less than two weeks from the regular-season tip-off against the New York Knicks at Barclays Center. Some residents still cannot comprehend the fact that they can walk to a professional basketball game in 10 minutes, and to a basketball team that could mess around and maybe have a great inaugural season and maybe take this city by storm. Watching the first few minutes of the home preseason opener against the Washington Wizards was quite a sight, not simply because basketball was taking place in Brooklyn, but because the fans didn’t really know what to do with themselves. Boos were either too loud or not loud enough, no one was fully sure of the Barclays protocols, and there was still a sense of shock that all of this was happening. Until this point, though, the focus has been on the Nets and Brooklyn. Come November 1, everything changes. Can the Nets be better than the Knicks? Will New Yorkers prefer Barclays to Madison Square Garden? Will the post-Linsanity fallout make believers out of undecided voters? In two weeks, we’ll have some answers. Until then, Brooklyn has been convinced to go hard for these Nets. Let’s just hope, for the emotional stability of the borough, that the players follow suit. No pressure.